Footprints of London is a company of tour guides leading walks in the London area. FpoL's Literary Festival takes place during the month of October with at least one walk available every day on a subject linked to writing, books or authors. A fellow guide (for I am a Clerkenwell and Islington guide myself) asked if I'd design something for them. There was a lot of information to squeeze in and the final printed product shown below bears scant resemblance to my first draft, the problem being that elements kept changing or being added to and graphic devices such as the quill and river were supplied mid-project. Nevertheless I waved my magic designer's wand and found a way to make all the disparate elements work in harmony. The calendar is colour coded with morning, afternoon and evening walks. This cook book is really a collection of ideas and inspirational tips and lists with a few recipes thrown in here and there. I mixed a different strong, but not bright, colour for each section. Although there was a basic grid with runners and rules etc, my design allowed for movement, helped by the simple and often amusing scraperboard-effect illustrations which make it a friendly, happy book to dip into. Approx 250mm tall, printed on a heavy-weight rough matte white stock. Above are the initial designs. Not all the spreads shown, but you get the drift. Epsilon Productions puts on small, award-winning thought-provoking plays. 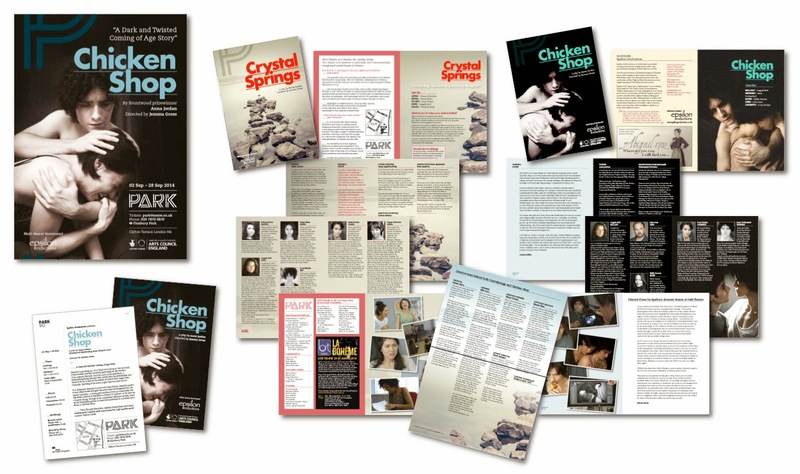 With two productions coming up one after the other, my initial brief was to create the poster and flyer for Chicken Shop using Park Theatre's standard templates but to make them look different from the already-created Crystal Springs print. Part two of the brief was to design and produce an A5 20pp programme that would cover both shows with two front covers and a common centre. I introduced a dirty pale blue to Chicken Shop poster that worked well with the poster image supplied. The blue and black theme then contrasted well with the reds and beiges of Crystal Springs and helped to delineate the two halves of the programme. All other elements within the programme also needed design input; ads, general info, blurbs etc. It was a bit of a jig-saw, but we got there! Sam Roberts and I became friends through our interest in London's ghostsigns (faded hand-painted advertisements on brick walls). Sam was recently out of the UK for two years doing voluntary work in the Far East. He started to notice that some of the lovely hand-painted signs in Cambodia were gradually being replaced by modern versions, so he got his camera out and started taking snaps. The end result is this 140pp book, that I designed and artworked for him applying his words and pictures onto a simple, and very adaptable square grid. Sam has written a fabulous recommendation regarding my work on this project on LinkedIn. It reads; "Jane took my idea for a book and turned it into a well-finished piece of design that now proudly sits on mine and many others' shelves. However, it wasn't just the design that impressed. It was also Jane's guiding hand throughout the whole process that helped me to learn and make considerable improvements throughout the project. 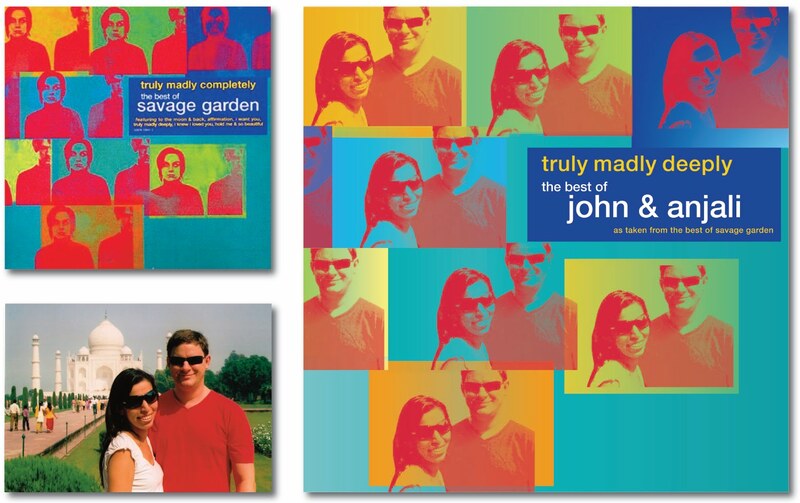 It was very much a team effort, done across two continents and seven time zones, me in Cambodia and Jane in London. This was only made possible by Jane's positive and flexible approach. Thank you Jane, I look forward to our next project together. If you have ever flicked through motorcycle magazines you will have noticed that most ads are loud, packed with images and over-colourful. 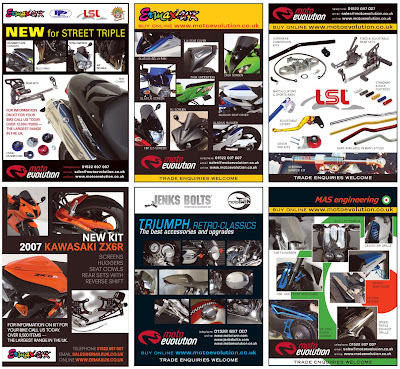 For MotoEvolution's diverse range of bike products we wanted to make the ads a bit classier but without looking out of place on the same page. Here is an update on the initial designs for CoreFiling ads. As you can see by the two pairs of ads below, the final versions were much stronger and more colourful. The colourful branding continues across other items – I have also designed, created and tweaked a set of product icons for use on the website and packaging. They also appear on the A4 information brochures which I have designed to follow a template using CoreFiling's house fonts. Smaller icons have also been created for use in the browser bar, however at the time of writing, these have not as yet been implemented. Ditto the redesigns for the website. Aslan is Turkish for lion, so I created a logo with a lion and lioness laying down side by side. This was applied to all elemets of signage and print including concertina menus, flyers, business cards and even signs for the toilets. I was also involved with the interior design and layout of the cafe bar itself. Fresh and friendly. Clean and bright and colourful. 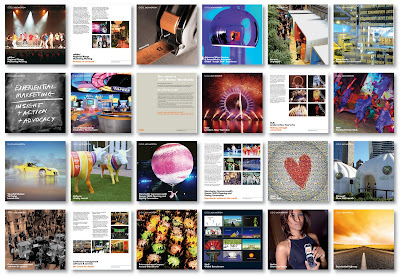 CoreFiling wanted to create a series of ad pairs featuring photographic images that illustrated their products. The ads were booked to appear on subsequent right hand pages, whereby the first ad intrigues and the second ad on the following spread clarifies the solution and the specific product on offer. Ads needed a coherent design that identified them as part of the CoreFiling brand, yet to be distinct as a product. My initial designs are shown in columns 1 and 2 above. After a lot of picture library research, I found a family of images that illustrated the problems and solutions. It wasn't easy! Then, I applied a palette of six distinct colours. I was keen to hold onto a repeated element on each ad, hence the graduated and black panels. After discussion with the client, a second set of designs was created, as shown in 3rd and 4th columns. The client wrote larger stronger messages which I aligned across the ads linked by leader dots. And the colours were made stronger. 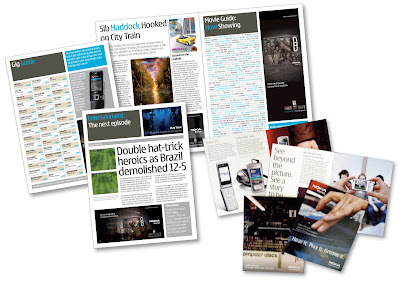 At a later stage the colours chosen for each product changed again and the approved final magazine ads feature solid colour panels on the right hand side. I also designed and created scalable vector icons in two sizes. See here for the subsequent designs. 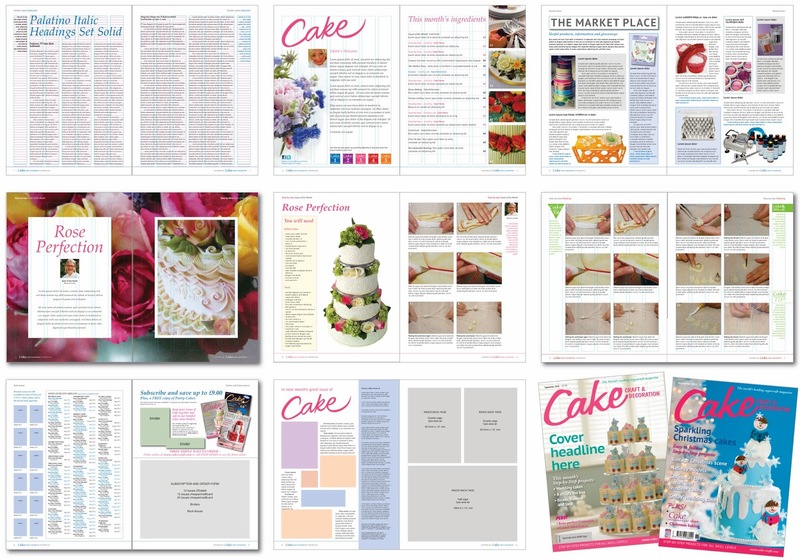 Cake is a magazine packed full of useful information for cake decorators. It clearly indicates how to create some truly stunning effects with sheets of sugar and food colouring. But the magazine needed a revamp that would not alienate its readership. 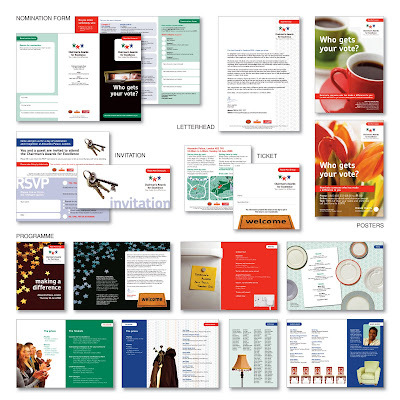 The brief was to bring it up to date without completely changing the friendly look and feel. The tidy-up involved new typefaces to separate the editorials from the step-by-steps, and a stricter though more adaptable 7-column grid with runners, folios and section headers. The banner heading on the cover also needed amending as the old one used up too much space and did not work very well at small sizes. The basic designs below show how I originally tweaked the old logo and spun it slightly anti-clockwise. At a later date, after conversations with the client to recommend a change, I completely redrew the Cake logo script from scratch and supplied a scalable file. 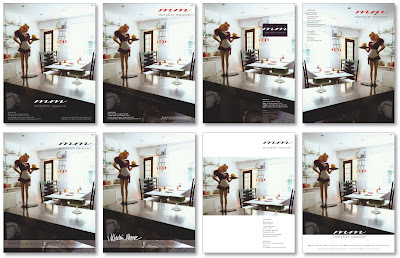 It can be seen bottom right, on the December 2013 front cover. In addition to the graphic design, I also create and sell items made using fragments of clay pipes that I collect from the foreshores of the River Thames in London. 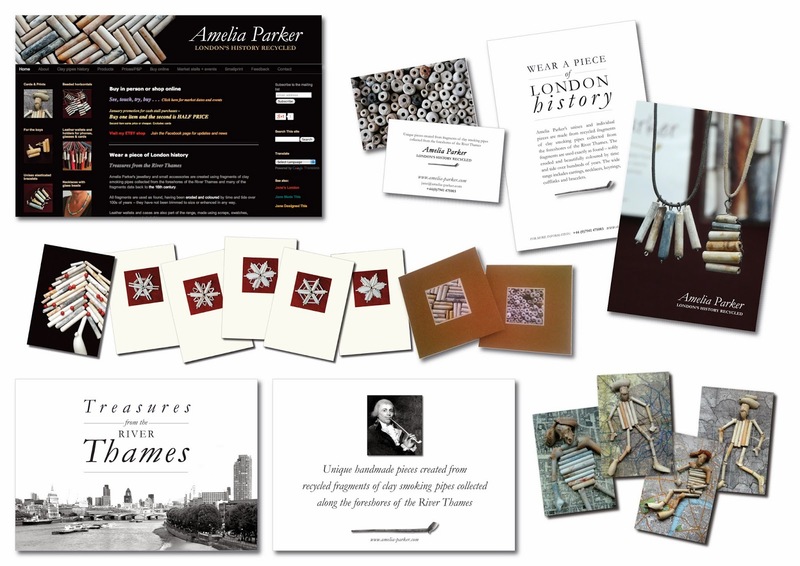 I wanted the information cards and signage for Amelia Parker to echo the lovely printed books of the 18th century, so Garamond, with its lovely choice fonts and ligatures, was the obvious choice. Shown above are some of the items I have created including the website (which echoes the colour of the market stall), business cards, signage for the stall, and greeting cards that feature my photographs of some of the textural patterns and figurative images I have created using the fragments. 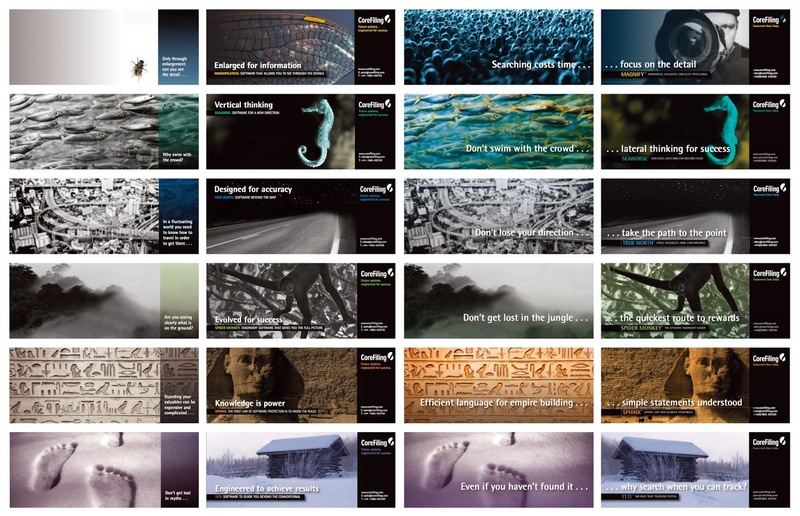 Below is a collection of some of the business cards I have designed and produced in the last few years. Let's face it, most business cards are just glimpsed at for a few seconds and then left in a darkened place for years. So I think they should be intriguing enough to provoke a immediate response. Hence, I like to keep my designs clear and simple as I believe it's the information that is the most important element here, rather than over-designed versions where the vital information is lost, cramped, or way too small/light. My designs feature text in a legible point size surrounded by a fair bit of white/light space for those extra inked-on scribbles, and I like to use photographs or graphic devices on the image side wherever possible. For instance, my own cards (both my personal one and the revised design for Amelia Parker clay pipe jewellery) feature my own shots of clay pipes – these images always get a good reaction. Another clever design device for the picture side of the card is to zoom in on an element of an image, or the logo itself, which then becomes clearer on the information side. The brief was to design, artwork and produce a series of books for a client who was keen on the clean lines of the Bauhaus. One of the books was to be picture-heavy containing archive photos and letters, so this was the book I chose to use for my initial designs. 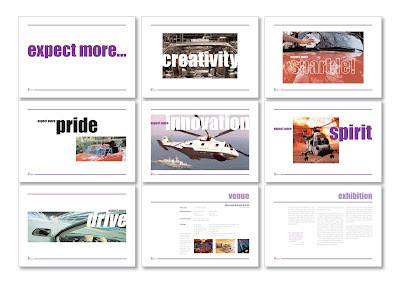 Below are some of the spreads presented at the first design meeting. Each row shows one of three different ideas on the same basic grid but implementing different Bauhaus-style devices. 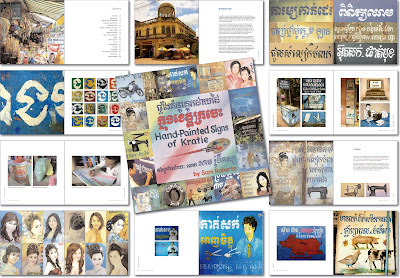 The middle one, shown here in blue, was chosen and, so far, three books based on this template have been produced, each using a different colour in place of the blue. Design and artwork for B&B catalogues is only started when the new products have been photographed. 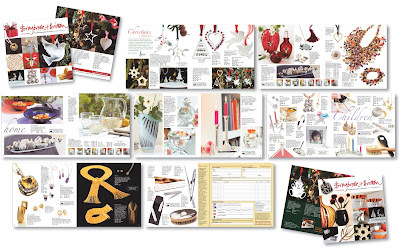 Many items are carry overs from previous catalogues and, unless there is a good reason for a whole page repeat, they need to be juggled about so that customers do not think they are looking at last year's version again. 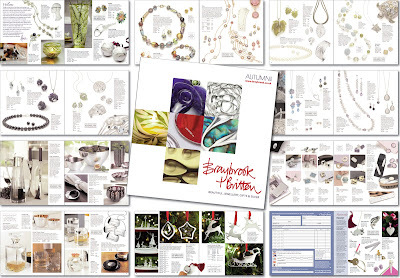 In 2012 there was no large catalogue but the bulk of the product shots, namely the jewellery items, still needed to be scaled at actual size before being further reduced to 80% for here. 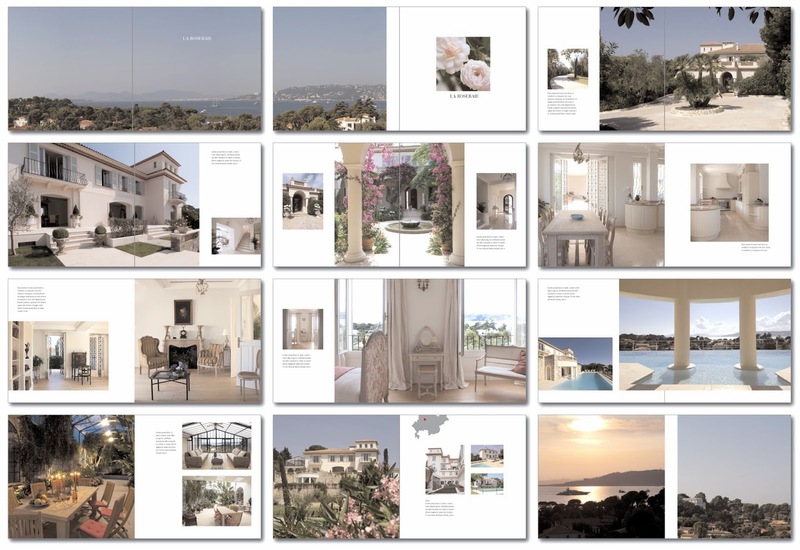 During the rough layout stages items get moved around a lot from page to page until the client is happy that we have achieved the best spreads to sell from. 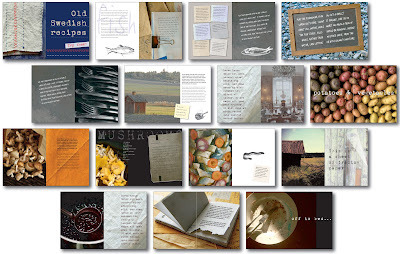 Seasonal product spreads appear in these pocket editions. Also included are many repeat spreads from the full size general B&B catalogues, but it's not just a simple job of scaling down as all of the fonts change for ease of legibility, plus the grid is slightly different as this one isn't perfect bound. 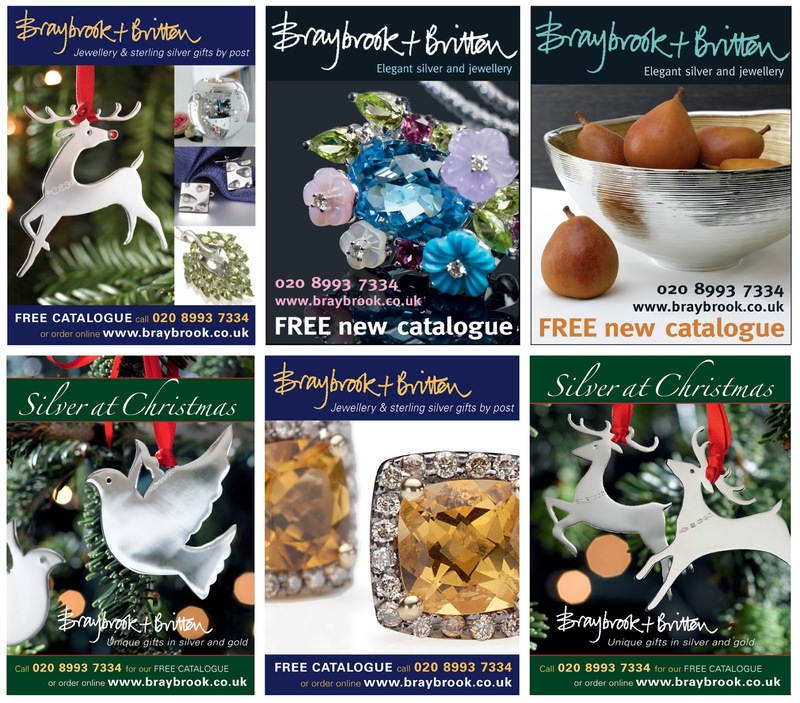 Having Rudolph on the has proved popular, so he, or one of his other sterling silver reindeer friends, has been on the cover of the Christmas catalogue in 2012 and 2013 as well. 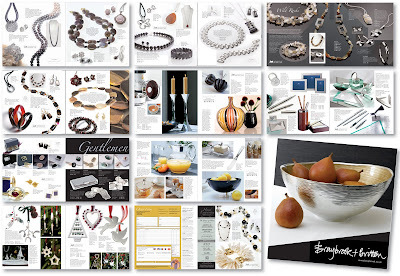 B&B catalogues are designed to be stylish, clean and easy on the eye. But every now and then a stock clearance is needed to make way for new products. This particular 8pp A5 leaflet was inserted into Sunday magazines and the like. The aim was to make it say 'sale' and 'reduced' without looking tacky. 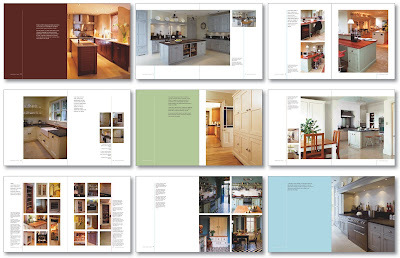 The client noticed that some of the best selling pages in the B&B catalogue where those that had bleed images or coloured backgrounds, and suggested that we introduce some coloured panels to the general design. A nice idea, but it was a tough call. The cufflinks spreads already use squared-up panels, but they are all small products – applying the same idea to other pages which show items of varying shapes and sizes, especially in the jewellery section where they need to be shown at actual size, makes it hard to create a grid that works without looking too messy. Shown below are the initial ideas I came up with, using random colours in blocks (colours would obviously be specifically mixed for each page to best enhance the products). But, realising that this would make each page an even bigger jigsaw puzzle than usual, plus creating further photographic and/or repro work, this idea has been shelved for the time being. Putting together succinct guidelines can sometimes be a hard job. Less is more. Especially on those pages that show what cannot be done with the logo – let's face it, that could go on ad infinitum! I worked closely with the brand designer on this one and we spent a lot of time on the naming and collating of the various master logo files, so as to (hopefully) avoid any confusion, and make these guidelines as easy as possible to follow and adhere to. 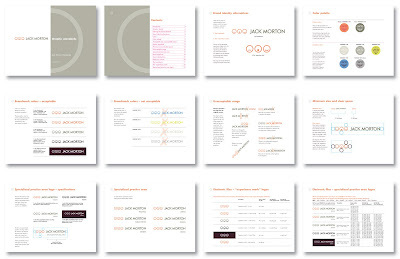 Earlier JM brand identities that I have worked on can be found here. A new logo and identity for IGDP, including stationery, leaflets and assorted items of print. I also proofread and/or re-wrote all the literature. Those blue blurry lines again. But this time with no background image and the whole effect looked a lot cleaner and neater. I managed to find time to go to the show and take some photos of the finished product. Happy to say I was really pleased with the quality and finish of the graphics. This was a private job for a friend who wanted something special to give as a wedding present. I created an LP-size pastiche mock-up of the cover of one of their favourite songs. It was float-mounted and framed and now hangs on their wall. Smaller versions were made for close relatives. Every year Amex put on a 'thank you' event for their best-performing employees, and in 2010 the theme was 'magic'. 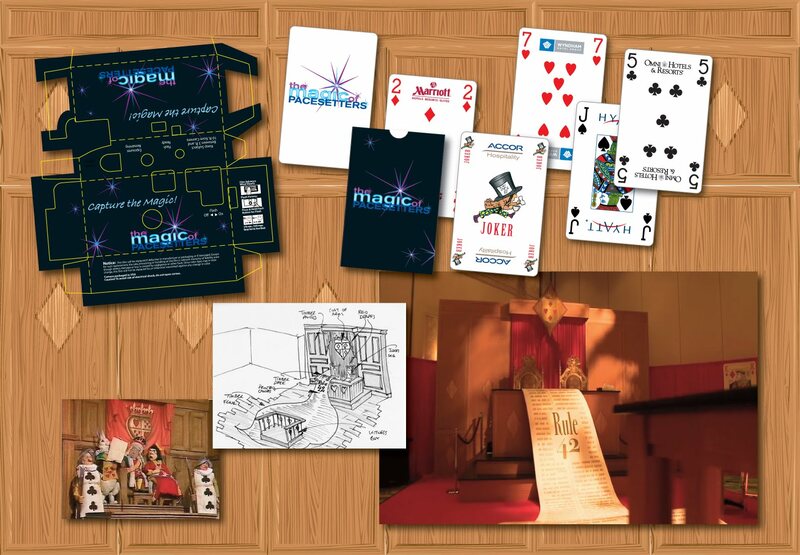 Shown here is a very small selection of some of the items of collateral and event graphics I created which included elements for an Alice In Wonderland courtroom complete with 'wooden' walls and desk (a pic of the finished thing is shown bottom left). 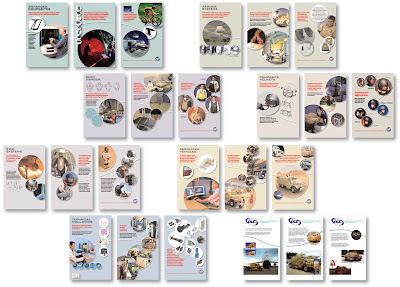 A series of promotional postcards for KIT who produce lightweight technical garments etc. The images were chosen and supplied by the client so it was all about making them work as a family of five. What a job! 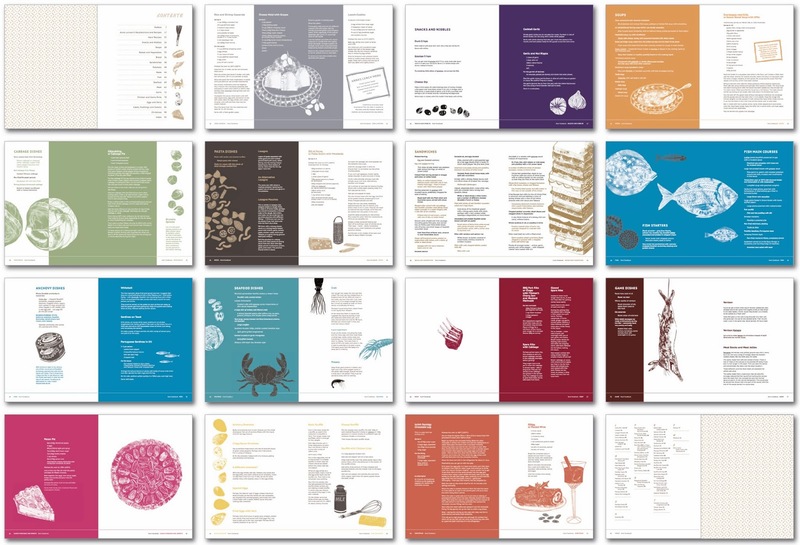 This product brochure, showing John Cullen's full range, was a tough job to produce, what with all the images to collate, diagrams and illustrations to draw or re-size, dimensions and spec to be added on at artwork stage, etc. The pictures down the right-hand edges show off some of the products in situ. 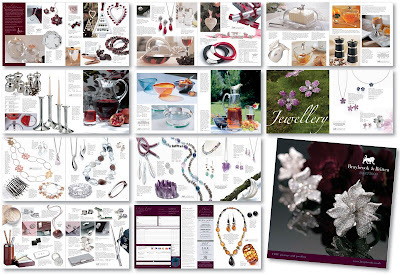 This is the second version of this catalogue I have produced; products are always changing or being added/deleted. As I write this I am in the process of designing the 'sister' design brochure which is picture-led and inspirational. 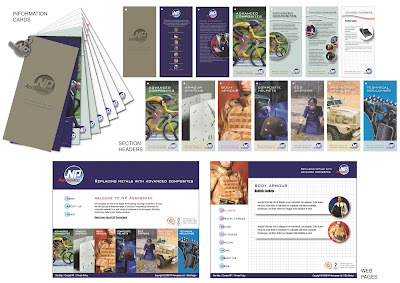 NPA's expansion has been rapid and their promotional leaflets, brochures, website etc all need to be brought together and given a simplified identity to connect the seven sectors and make them look part of the same forward-thinking company. 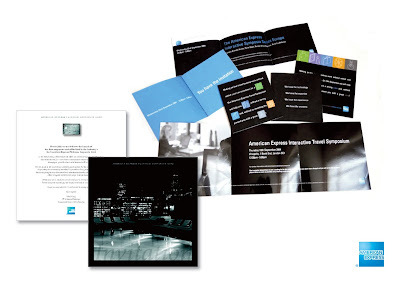 Following on from the success of the partial redesign for the panels at Excel 09, I came up with an idea to replace the existing mis-matched leaflets and gatefold brochures with DL-sized swatch cards that could be tailored to suit each individual client's needs. These would be fronted by and held together with die-stamped composite plastic manufactured by the company itself. The website would also echo the same design. Unfortunately this project is on hold for the time being. I designed this in close conjunction with Iain. 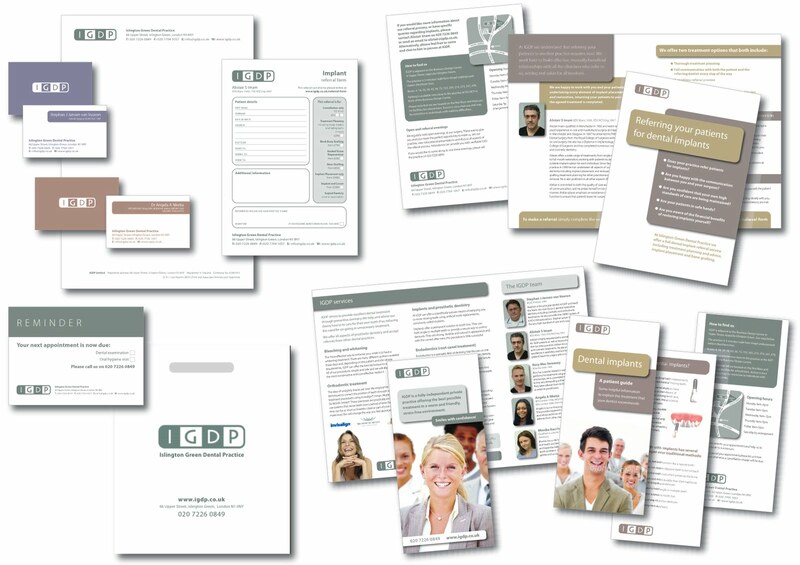 Our client wanted the brochure to be clean, modern and use plenty of white space. From the client's large database of images we chose what we considered to be the best ones and, using these as inspiration, invented a flexible grid and a palette of earthy yet contemporary colours to complement them. Sadly, probably due to the current financial climate, the client pulled out and the project has been shelved. Fingers crossed they change their minds as this would have been a lovely piece of print. 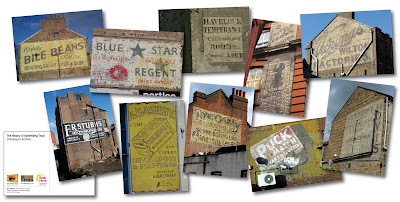 In conjunction with The History of Advertisng Trust (HAT) and Rank Hovis, Sam Roberts has been busy setting up an archive of all the old painted advertising signs that were painted directly onto walls over the past century. As well as taking lots of photos of these myself, I have been helping him with design and artwork for various items in conjunction with this project. This set of 10 postcards has been created for the launch event, though we hope we may be able to sell more in the future to help fund the project. We are also working on a book of the same. 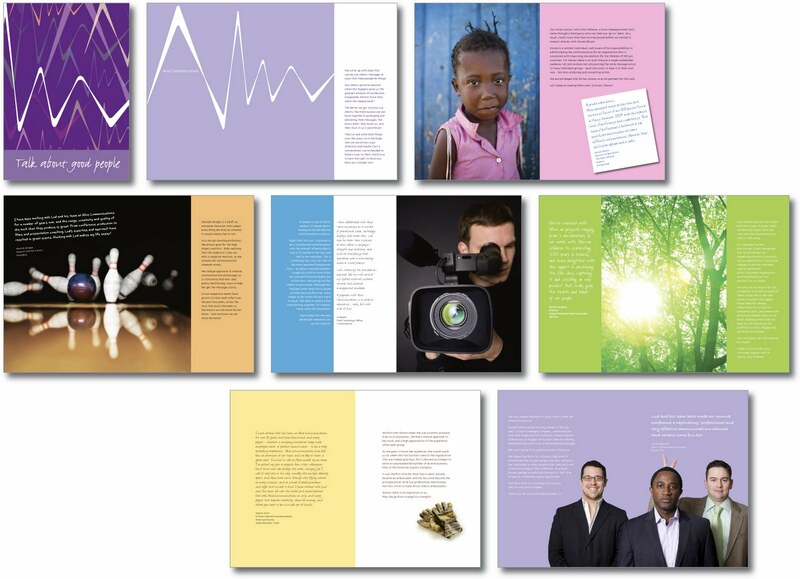 These product cards were created for use at the Excel 09 event using the same colours for the 7 sectors, but an overall grid/graph background was added to denote technical design. The client, a bespoke kitchen maker, was a bit vague as to what was required; what look to achieve for their high-end advertising campaign. There was even talk of producing a new logo. Using three very different images, Iain and I came up with a few rough ideas to show them how each might be used in various different ways. One of those images is shown here. The project has been shelved for the time being. I have produced the artwork for the stationery for this company for over 12 years through 3 different name changes and 5 different identities. 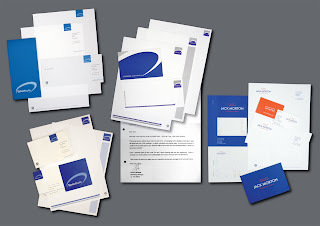 It comprises not just the usual letterhead, comp slip and business cards, but also a long list of labels, stickers and inserts for items such as CD cases, presentation documents and wallets, VHS and Beta tapes and cases, document covers, even carrier bags. Shown here are the four early identities. Guidelines for the current one can be found here. "Dear Jane... The brand launch, without doubt, was our best ever... An enormous amount of credit for the success goes to you, because without your hard work and professionalism it would not have been possible.... [we] found working with you very reassuring. Yours is certainly a job where patience and unflappability are a bonus and you have it in abundance...."
Two smaller brochures for B&B ; a 12pp insert and a 48pp Christmas mailer based on the full-sized September version. These are not just scaled-down versions of the earlier ones, but re-styled and re-jigged pages as the fonts all change for these smaller editions for ease of legibility, so everything has to be cross-checked for erroneous line breaks, mentions of 'actual size' etc. 64pp plus covers. 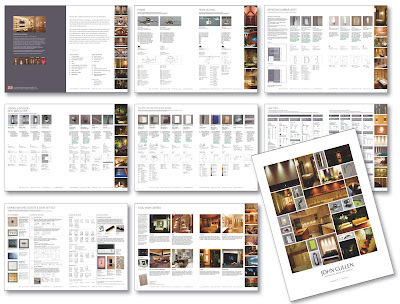 Layouts for B&B catalogues are planned once all the products have been photographed. All jewellery has to be shown actual size and this means it is always a major jigsaw puzzle. 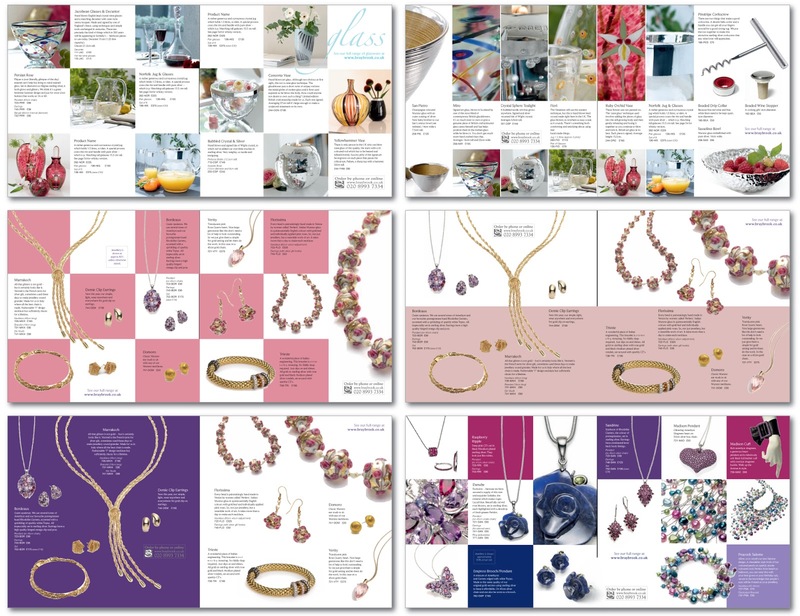 During the rough layout stages items get moved around a lot from page to page until the client is happy that we have achieved the best spreads to sell from. 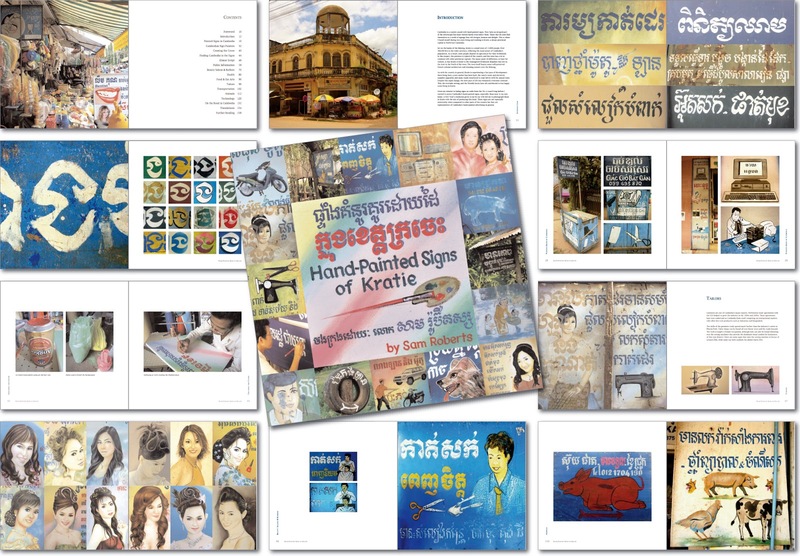 Shown here are pre-press pdfs, hence some really rough cut-outs; the extensive Photoshop work, to merge and montage some images together, is done by the repro department at the printers. NP Aerospace wanted a more modern, clean, coherent identity. And they wanted this to start from the Excel 09 event where they had a large stand. Time was of the essence, so, retaining the roundel version of the logo, I designed a template that could be adapted for use on each of the 7 sectors, giving each of the 1.5m triptychs a dirty pastel backround colour, utilising a red thread to hold together the 'story' of how their products are manufactured from start to finish. 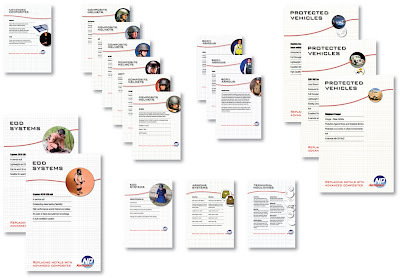 This design was then adapted for use on the individual product cards using the colours as an overall grid background. The same idea was also applied to the 3 panels for the IST toblerone, part of the same stand, shown here bottom right. At JM they call these 'Snapshots'. 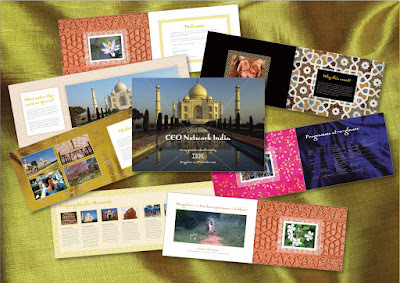 Each 2-sided card is about one aspect of the company's strengths, or for one event or project. My task when designing and artworking them, was to set up a loose template and then, depending on the images available for each one, choose the most intriguing or arresting image for the front of each card. For some of the more generic cards, a whole new image might need to be sourced or created from scratch. On the reverse of each card a small selection images were chosen to accompany the text describing briefly the project from brief to completion. There are 100s of these. Every year The Royal Mail Group invites its staff to nominate a fellow employee for an award. 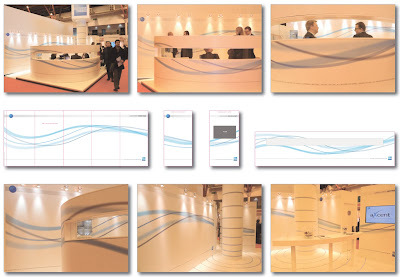 The 2008 event was designed to look like a house with, for instance, themed wallpaper and carpet, a really large front door and over-sized electrical sockets. Shown here are my initial designs for the various print items which continued the same idea – the posters featured everyday treats and rewards; the nomination form had a door on the front; the invitation had keys; the ticket had a welcome mat; the event programme featured things such as a reminder post-it on the fridge, a branded tablecloth with plates and menu, a coat stand on the prizes page, lights and lampshades for the nominees (luminaries! ), and dining chairs for the judges. Sadly, for me, a lot of these ideas were watered down by the time the job was finally artworked. The client was keen on the brown and gold stars image on the front of the programme and wanted this to be repeated wherever possible, in particular the posters, the nomination form and the ticket. Re the internal pages of the programme, only the fridge and and the plates made it through to the final cut. I still say they could have used children's fridge magnet letters for the A-Z nominations. Ah well, what do I know?! Three years running I have set up the templates and produced the artwork for these A5 event guides. 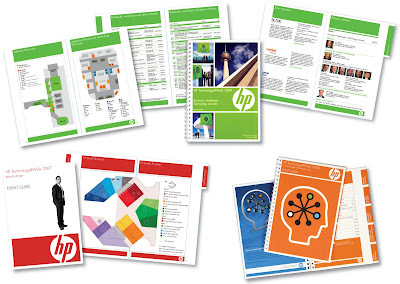 They are full of seminar listings, company overviews and speaker biogs etc following HP's strict company style guidelines. It's "Style Sheet City". Strange as that may sound, messing about with type and forms is something I really enjoy as I find a great sense of satisfaction when it all fits in well, looks good and is easy for the user to understand and navigate. Jack Morton created and produced the opening and closing ceremonies for the Olympic Games 2004 in Athens. 1000s of photographs were taken and a selection was was put into a 220pp book called 'Ceremony' which told the story of the making of these events. I picture edited, designed and created the layouts and artwork, based on a rough template that had already been set up. I also went to the printers to do a press pass etc. 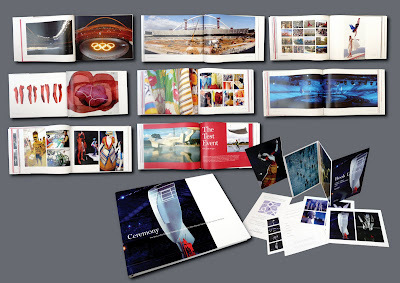 I am really pleased final printed book, and it was hard choosing just 8 spreads to show here. I also designed an invitation for the book launch; my idea being a 6pp concertina leaflet that could be torn along perforations to make individual postcards, one being the reply paid card acceptance card. Sad to report that the printer used perforations that were too close together and thus the things just fell apart once opened. I was SO disappointed! Other landscape format postcards were also designed. Design and artwork for various items of print for Felt. From L-R: invitations, leaflets, ads. Two invitations for American Express events. And,top right, mocked-up at smaller sizes than the final glossy printed item, are some of the early designs for that particular event. I was really getting into this and then the event was cancelled. Hence, these are working designs. I wanted each of the 16 A4 pages to depict some of the sumptuous colours and textures of Banaglore. An earlier design for an event at St Andrews is here. A prestigious event and what a lovely job to work on. The design had already been created and approved. I was brought in to streamline it, pull the artwork together and oversee the print, which was almost a disaster, the printer having omitted to buy in the correct cream paper stock. But in the end we got them to flood the pages with 7% yellow and the same effect was achieved. 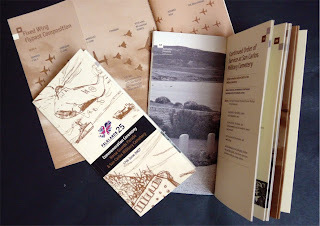 I watched the flypast from The Mall on the day and it was great to see so many people clutching their copies as souvenirs of the day. In Top Gear – shown here is the A4 pocketed folder, notepad, pocket event guide and delegate badge. 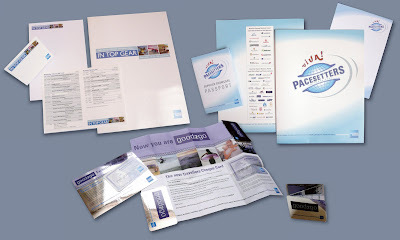 Pacesetters – there were over a hundred exhibitors at this event and as well as the signage for each of their booths (not shown) there were various bits of print to produce for the delegates including an A4 pocketed folder, notepad and 'Passport' which was a marketing device for delegates to tick off every booth they visited and perhaps win a prize. 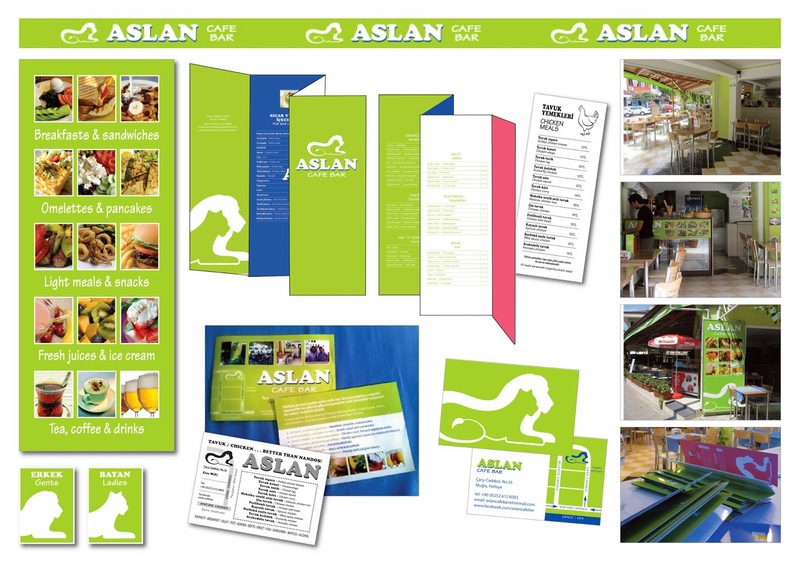 Good2G0 – The fold up leaflet was based on a patented idea already in print. The screen-printed mirror card theme, used on the fronts and backs was also echoed on the postcard-sized invite and many other items (not shown here) such as A3 posters and a box containing a range of cosmetics that were also branded with the event logo. 64pp plus covers. Layouts for B&B catalogues are planned once all the products have been photographed. During the rough layout stages items get moved around a lot from page to page until the client is happy. Add to the mix that all jewellery items have to be shown actual size and it becomes a sparkly puzzle. But the end result is always worth all the effort.